Welcome to the PREMIER+™ 2 Newsletter. Check out our breaking information in News, then stick around for some inspiration! 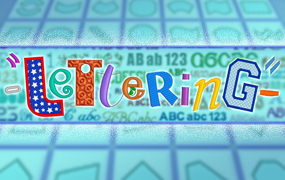 Today's topic is Lettering in So Many Styles and Shapes. Available for use with PREMIER+™ 2 ULTRA, EXTRA, EMBROIDERY and EMBROIDERY INTRO. Adjust the colors and stitching used in this font when you create lettering with it in PREMIER+™ 2 Embroidery, or transform a copy of this font in PREMIER+™ 2 Font Create in PREMIER+™ 2 ULTRA (Windows only). 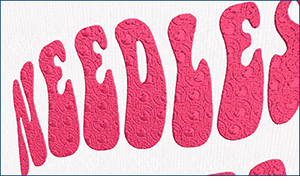 Lettering is without question one of the most often used features in the PREMIER+™ 2 Embroidery System. 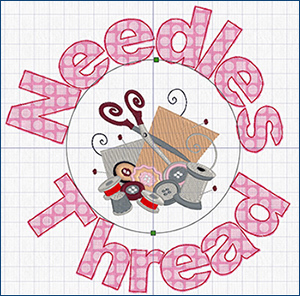 Let's take a look at some of the Letter functions that offer you so many styles, sizes, shapes and stitch options! From the PREMIER+™ 2 Embroidery Intro package through PREMIER+™ 2 ULTRA, you can find many different letter sets, and the number of included fonts increases with each package. The handy Font viewer lists the fonts by their Categories. Font names include information in addition to the name of the lettering style. 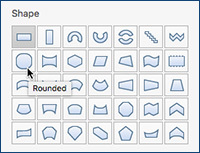 All font names include the recommended size range, and other information is often included. A recommended font size is included in the name. For instance, 25-120mm indicates the font is recommended for use at sizes from 25mm to 120mm. 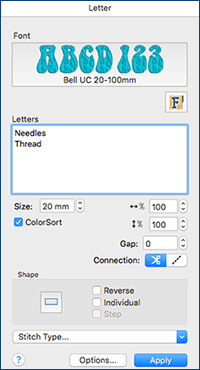 For SuperFonts provided in different stitch type variations, a stitch type abbreviation is also present at the end of the name, for example SF for Spiral Fill. Revue 2C UC 25-120mm SF in the Display category: this font uses two colors (2C), is uppercase only, has a recommended size range of 25mm to 120mm, and uses Spiral Fill. Antonia NP 05-10mm in the Nearest Point category: this font is a Nearest Point font and has a recommended size range of 5mm to 10mm. Fonts in the Letter panel can also be adjusted in many ways. The selected Font is displayed in the Ribbon Bar or Letter panel. Bell UC 20-100mm is shown in the illustrations. Type your words into the Letters box. You can even type in multiple rows, for poems, quilt labels, and more! Size defaults to the smallest recommended in the size range. 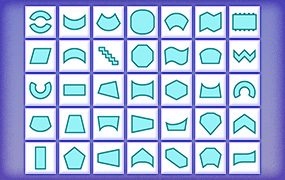 35 Shapes, including FreeSculpt with unlimited shaping options, open the door to your creativity! It's easy to pre-set individual letter characteristics, such as Stitch Type, according to the type of font you've chosen. However, if you forget, or change your mind, you're only a right-click away from a pop up menu with options to adjust Properties, Stitch Types, and more! Not the right color? Just double-click the thread bands in the Color Select box, (on the Home tab on the Mac) and select from the thousands of included Thread Ranges or your own personalized MyThreads databases! 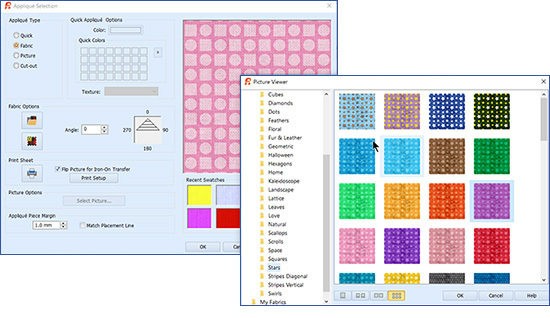 ColorSort also reduces redundant color changes as you Export to finalize your embroidery for stitching. 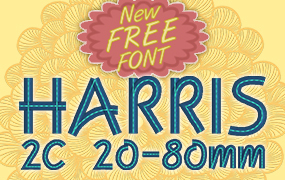 Use the new Handles menu on the select box for the lettering to unlock the real artist in you! Now, Lettering can truly set you free! 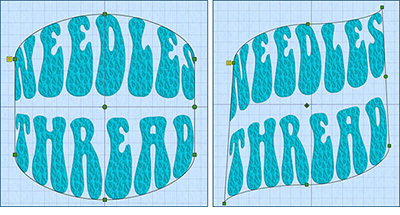 If you are a collector of purchased fonts (in the form of embroidery letter designs) you can use Import Font from Embroideries in the Font Manager to save the files into a special format that makes them available in the Font viewer under the My Fonts category, so you can utilize Shapes and other Letter system settings to assist in aligning and placing those purchased Fonts! Of course, you also have Quick Font in the Font Manager, to transform your operating system fonts from TrueType (TT) or OpenType (OT) into Font sets that utilize all the fabulous features available in PREMIER+™ 2's Letter tab. With so many new functions added to the Letters tab in PREMIER+™ 2, it's sometimes challenging to decide which one to use! Let's look at a few of the things you can do! Bell UC 20-100mm is shown in the illustrations. 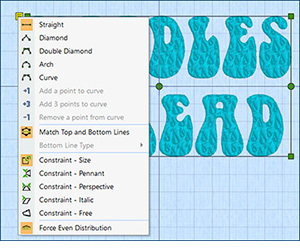 Use the Handles menu to change a Straight Line Shape into Diamond, Double Diamond, Arch, or Curve. 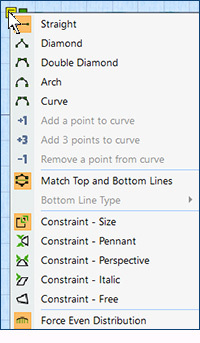 Remove the locking constraints, and adjust and skew as you prefer! Change up the Pattern Fills and thread color, then view in Life View . Design around your hobbies, and preview in your own style! There are so many ways to express yourself with the Letter options in the PREMIER+™ 2 Embroidery System! ... you can import your collection of purchased embroidery font sets into Lettering using Import Font from Embroideries in Font Manager ? Have a fabulous day, from the software team at PREMIER+™ 2 Embroidery! Join us next month as we explore how to add Decorations for previewing on your designs, and marking their placement during embroidery, with the PREMIER+™ 2 Embroidery Extra!